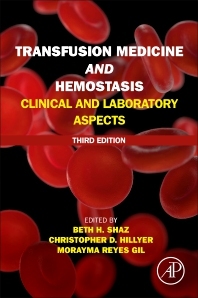 Transfusion Medicine and Hemostasis: Clinical and Laboratory Aspects, Third Edition, is the only pocket-sized, quick reference for pathology and transfusion medicine residents and fellows. It covers all topics in transfusion medicine and clinical and laboratory-based coagulation. Chapters are organized by multiple hierarchical headings and are supplemented with up to 10 suggested reading citations. This single handbook covers all the topics required to meet the goals of a major program in transfusion medicine and clinical coagulation. Changes to this edition include the latest AABB standards and new chapters focused on a wider range of specific populations requiring blood and related products. Coverage includes essential updates on peripheral blood and bone marrow hematopoietic progenitor cells, as well as cord blood banking and regenerative medicine. The authors also examine advances in therapeutic apheresis and new cellular therapies. Beth H. Shaz, MD, is Chief Medical and Scientific Officer, Executive Vice President at New York Blood Center, and Adjunct Assistant Professor, Department of Pathology and Cell Biology, Vagelos College of Physicians and Surgeons, Columbia University. Beth is responsible for all medical and scientific activities throughout the NYBC network, which includes Rhode Island Blood Center, Innovative Blood Resources (Memorial Blood Center and Nebraska Blood Center), Community Blood Center of Greater Kansas City, and Blood Bank of Delmarva. Medical activities comprise of hemophilia services, clinical apheresis services, perioperative autologous transfusion services, cellular therapy, medical education, medical consultation, transfusion services, bone marrow donor recruitment, and donor management. Scientific activities include basic science at the Lindsey F. Kimball Research Institute and Comprehensive Cell Solutions (CCS), which contains translational and clinical research. NYBC’s scientific and medical activities focus on transfusion medicine, cell therapy, regenerative medicine, infectious disease, hematology, and personalized medicine. Beth is an editor of ten books in transfusion medicine, author of over 130 articles pertaining to transfusion medicine. She is an associate editor of TRANSFUSION and on the editorial board of BLOOD. Previously, she was an Associate Professor at Emory University School of Medicine and director of the transfusion service at Grady Memorial Hospital. Also, she was an instructor at Harvard Medical School and associate director of the transfusion service at Beth Israel Deaconess Medical Center in Boston. Beth received her MD with research distinction from the University of Michigan and BS in chemical engineering with distinction from Cornell University. She completed a general surgery internship at Georgetown University, an anatomic & clinical pathology residency at Beth Israel Deaconess Medical Center, and a transfusion medicine fellowship at Harvard Medical School. Christopher D. Hillyer, MD, is President and CEO of New York Blood Center and Professor, Department of Medicine, Weill Cornell Medical College, New York, NY. Previously, he was the tenured, endowed Distinguished Service Professor, Department of Pathology and Laboratory Medicine, Emory University School of Medicine and served as director of the Emory Center for Transfusion and Cellular Therapies with responsibility for all aspects of clinical and academic transfusion medicine at Emory’s seven principle hospitals. Dr. Hillyer is an editor of twelve textbooks in transfusion medicine, author of over 160 articles pertaining to transfusion, human immunodeficiency virus, and herpes viruses, most notably cytomegalovirus. Nationally recognized as an expert in hematology and blood transfusion, Dr. Hillyer is also a past-president, board of directors of AABB and a former trustee of the National Blood Foundation. Dr. Hillyer has been awarded many million dollars in research funding from the National Institutes of Health, the Centers for Disease Control and Prevention and other agencies. He was an associate editor of Transfusion and serves on several other editorial boards. Dr. Hillyer was formally recognized for his work in Africa as part of the AABB/Emory cooperative agreement from the President’s Emergency Plan For AIDS Relief (PEPFAR), and is a recipient of two Tiffany Awards from the American Red Cross where he also served as a medical director and a member of their national Medical Advisory Board. He also received the 2014 Emily Cooley Award from AABB for his “significant commitment and contributions to the field of transfusion medicine through extensive teaching, mentoring and professional leadership, and the countless clinical, scientific and innovative resource materials he has created to educate others”. He is a co-founder of Transfusion & Transplantation Technologies, Inc (3Ti) and holds over 20 patents or patents pending. Dr. Hillyer is board certified in transfusion medicine, hematology, medical oncology and internal medicine. He received his BS from Trinity College, and his MD from the University of Rochester School of Medicine, with postgraduate training and fellowships in hematology-oncology, transfusion medicine and bone marrow transplantation at Tufts-New England Medical Center. Morayma Reyes Gil, MD, PhD, is an associate professor in the Department of Pathology at Montefiore Medical Center (MMC) and Albert Einstein College of Medicine. As the director of hematology and special coagulation laboratories, Dr. Reyes Gil oversees all hematology and coagulation laboratories at all MMC hospitals, collaborates in clinical research and clinical trial studies and continues translational research in vascular biology. She started her career in academic pathology at the University of Washington as an assistant professor in the Department of Pathology and laboratory Medicine. Dr. Reyes Gil has been a recipient of several awards and research grants from private research foundations and from the National Institutes of Health. Dr. Reyes Gil is board certified in clinical pathology and has authored over 50 peer-reviewed articles in the field of vascular biology. Dr. Gil is a graduate of the University of Puerto Rico. She received her MD and PhD from the University of Minnesota. She then completed a residency in clinical pathology and specialized in coagulation and benign hematology at the University of Washington.